Some of YCW London’s directors and inaugural mentors and mentees gathered to celebrate a successful year in July 2018. The first YCW London Mentorship Program is coming to an end after an exciting year filled with events and workshops. Last year, YCW selected 18 talented mentees from leading London universities King’s College London (KCL), London School of Economics (LSE), and the School of Oriental and African Studies (SOAS) and partnered them with mentors from a wide range of industries according to their interests and career goals. In addition to building a fruitful relationship with their mentors, mentees were able to learn more about China and careers through a wide range of workshops that connected them with China experts from numerous backgrounds. Having had the opportunity to attend these workshops and to form a close connection with my mentor and my fellow mentees has been an invaluable experience this past year. Listening to the insider experiences of the speakers helped me to see and reassess China from a new perspective. In one interesting workshop, Lily Kuo, The Guardian’s China correspondent, told us about her personal experiences working and living in China. In another engaging workshop, Trey McArver, co-founder of Trivium China, gave us an insight into why he started his business over a pint. These discussions during the workshops provided an especially beneficial platform to challenge our views and receive concrete advice on how to start our careers. I am particularly thankful for the career advice I received from my mentor, Zhongyang (Benjamin) Lu, who was always available to me if I had any career-related questions or even just to have a chat. We met over coffee to discuss my career plans, industries I am interested in, and optimize my CV, drawing on his experience in the banking sector and his life in and outside of China. I heard from the other mentees that all of them had formed a close relationship with their mentors as well, receiving advice reaching from how to choose a career, connecting them to people working in their field of interest to giving them practical tips during the application process. During our last meeting, one of the mentees said that she had only chosen her current job related to foreign affairs because her mentor had encouraged her to give it a try. As a cohort, we also liked that the events and the meetings with our mentors took place in an informal setting, enabling us to speak freely with one another and to share our opinions. But not all meetings of the mentorship program were about careers and work. 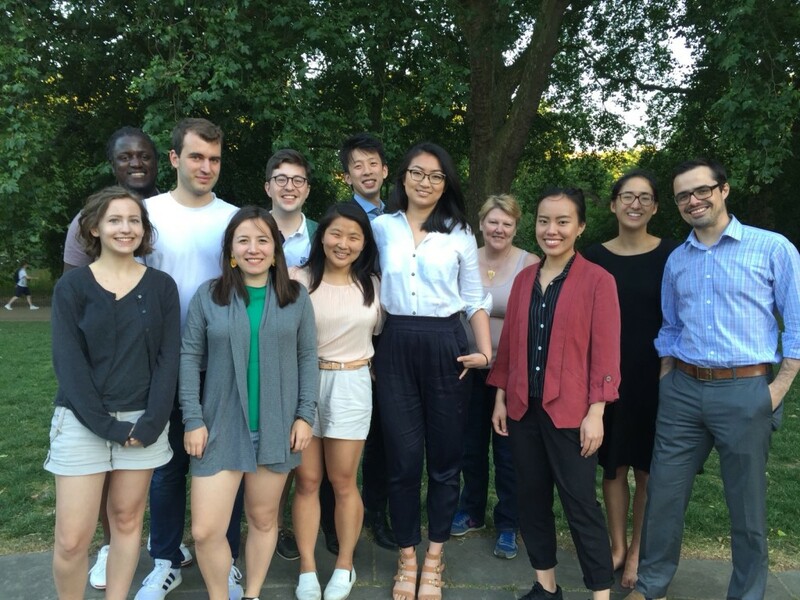 Throughout the year we had the opportunity to get to know our mentorship cohort better through several social activities such as celebrating the Chinese New Year at a hotpot restaurant, having a lovely picnic in a park in summer or after-workshop drinks, which were all great fun. Being a part of the YCW London Mentorship Program the last year was truly a fulfilling experience and helped me to make new friends and connect with China experts from all fields. All of us from our mentorship cohort are extremely grateful for all the work of the YCW London mentorship organising team and we hope to stay in touch in the future. Calls for the next cohorts of the London and Beijing mentorship programs will be sent out over August and September 2018! Jeannie Neugebauer is a MSc candidate in China and Globalisation at King’s College London and holds a BA in Chinese Studies and a BSc in Business Administration from Ludwig-Maximilians-University Munich. She previously lived and studied in Beijing for two years, where she discovered her future research interest in China’s digital and technology development.